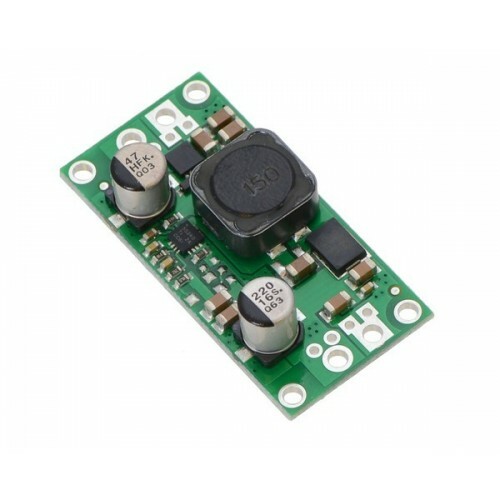 These step-up/step-down regulators take an input voltage from 3 V to 30 V and increase or decrease it as necessary to produce a fixed 5V, 6V, 9V,12V or 24V output, depending on the version. They are switching regulators (also called switched-mode power supplies (SMPS) or DC-to-DC converters) with a single-ended primary-inductor converter (SEPIC) topology, and they have a typical efficiency between 80% and 90%. 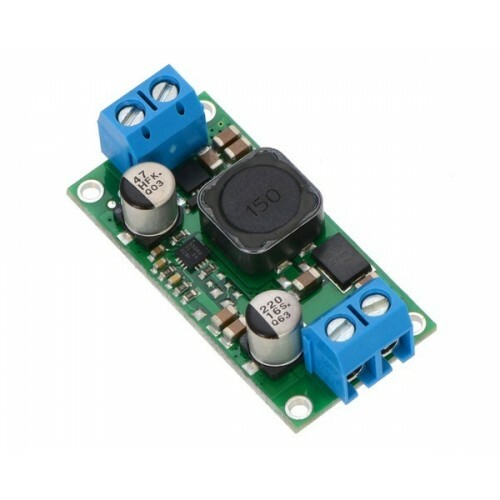 The available output current is a function of the input voltage, output voltage, and efficiency (see the Typical Efficiency and Output Current section below), but it will be around 2 A when the input voltage is close to the output voltage. 32 V is the absolute maximum operating voltage; the recommended maximum operating voltage is 30 V, which is the limit of the reverse voltage protection. 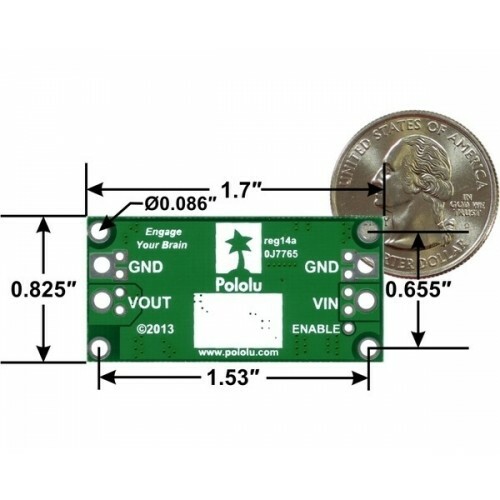 Pololu fixed step-up/step-down voltage regulator S18V20Fx with included optional terminal blocks and header pins. 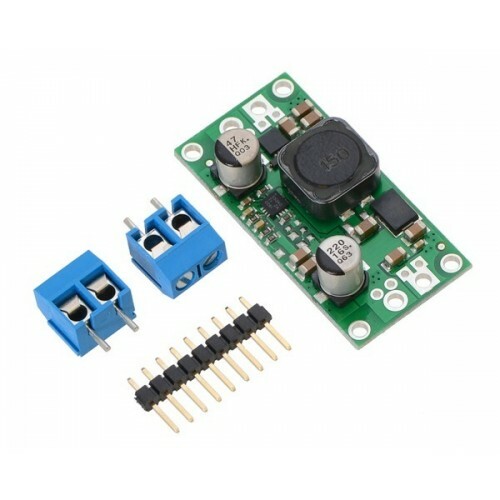 Pololu fixed step-up/step-down voltage regulator S18V20Fx, assembled with included terminal blocks. The connections are labeled on the back side of the PCB, and the board offers several options for making electrical connections. You can solder the included 2-pin 5mm-pitch terminal blocks to the two pairs of larger holes on the ends of the board. Alternatively, if you want to use this regulator with a solderless breadboard, 0.1″-pitch connectors, or other prototyping arrangements that use a 0.1″grid, you can solder pieces of the included 9×1straight male header strip to the 0.1″-spaced smaller holes (each large through-hole has a corresponding pair of these smaller holes). For the most compact installation, you can solder wires directly to the board. The board has four 0.086″ mounting holes intended for #2 or M2 screws. In applications where mounting screws are not used and wires are soldered directly to the board, the insulated part of the wires can be passed through the mounting holes for strain relief. The picture above shows an example of this with 20AWG wire, which was close to the limit of what would fit through the mounting holes. 1. Without included optional headers or terminal blocks. Height with terminal blocks installed is approximately 0.5″. 2. Without included optional headers or terminal blocks. Terminal blocks add 3.4 g.
3. Absolute maximum. Recommended maximum operating voltage is 30 V, and reverse voltage protection only works up to 30 V.
4. Under typical conditions, where the input voltage is close to the output voltage. Maximum output current can be higher when stepping down and lower when stepping up. 5. For input voltages up to 30 V.
6. Typical worst case (i.e. with VIN at 3 V). Quiescent current depends on the input and output voltages and is much lower for most of the input voltage range. The ENABLE pin can be used to reduce the quiescent current to well under 1 mA.